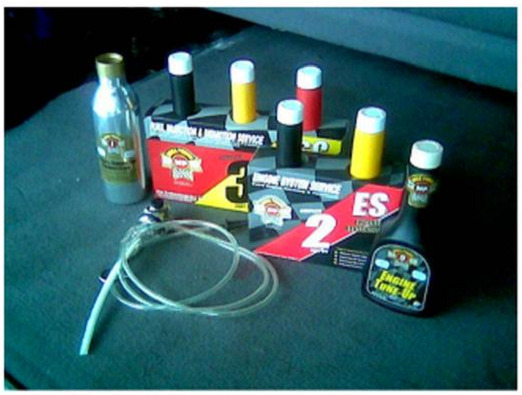 This engine tap remedy avoids this car repair problem while you drive! The valve tapping noise problem. 3 remedy's. Car owners are caught by surprise when a tapping noise starts coming from their engine - and its no wonder, since engines never make any such noise normally. Is tapping a serious sign of something worst about to happen? What is the fix and it cost? Yes its a serious problem with repair running pass $2000. The cause...and our best remedy. Over time, dirty tar-like goo, coats every engine part. The tap sound occurs from 2 places when dirty conditions accumulate. Tapping occurs when sludge block oil delivery to one or more of your motor's valves lifters. When that happens a wear take up adjuster in the lifter drops and a space appears. As the motor parts rotates the space closes with a hammer-like smack when goes to open the valves. Tapping occurs as oil residues build up on your motor's valve stems and or head. When that happens the valves close slower. As the motor's valve lifters rotates away from the valve a space appears. The hammer-like smack occurs as a tap when the space closes on the next upward valve opening sequence. a rough idle may also occur. Since your motor has 8 to 24 valves and 24 valve-lifters for each valve, any one of those parts could cause the tap. Transmissions also have valves, and sticking cause rough shift - also a $2500 repair fix, our product also corrects for you. What mechanics do as their engine tap remedy. The usual mechanic's method is remove and clean and inspect each valve part - and replace all half worn parts. All valve lifters are yank out and replace with new ones, and a new oil pump is installed - as the usual $2500+ remedy. These is a less invasive way.... we like better! The Slo-wear Engine Tap Remedy. The product works by you installing 6 items, 3 at a time a week apart by addition into the gas and oil. Then driving for a week. The chemistry removes tap making dirty conditions. Why can't oil do that, you may wonder? The tap problem I guess, means its beyond oils ability to prevent or end it! A week later, add the 3 other items shown during an oil change. Its this product and cleaning ability even synthetic oil can't remedy, is what chemically restores oil flow, cleaning away of the goo, and restores function that ends the tap! Cost is about $250 - not $2000, if a mechanic does the treatment. Under $100 if you install the treatment. Its easy to install. Driving does the actual fix. What we call the Slo-wear Valve Tap Treatment is shown here. Sold only online. Shown above:: The engine tap remedy is a "6 item Treatment" containing a complex set of ingredients - invented for solving the problem in a better way. Results ends tap, engine knocks, and ping by cleaning and conditioning each valve and lifter part to almost instantly work great as new again! This is what your engine and budget and life needs! Doing so restores years more car life and dependability - even to worn out vehicles! This is what your car needs! Order now! One Mega Power Valve Treatment. 6 items as shown. Comes with easy-to-follow instructions. My phone help if needed. Guarantee. Shipped FedEx to your door in about 3 days. $80+ $15s&H=$95 total. Save $30. Engine tap Remedy. Car wear and performance upsetting conditions end. 3 problems occur from sticky residues - residues that are too sticky to drain out during oil change. Your engine valves require extra power to push them open when sticky. This speeds up wear out. Residues slow their closing speed. A space appears on adjoining parts. As rotation occurs and then closes the gap - you hear the results as a tap with each motor rotation. Does that sound like your problem? Residues also sticky or make sluggish your motor' piston rings - metal bracelets wrapped around the pistons to keep motor oil out of the combustion process, while holding combustion above your piston. Blow-by" results - meaning, cooking hot acidic gasses escape pass the piston, to mix with your oil. This creates sludge and your problem. When your valves begin closing slower, a space or gap appears that should not be there. Parts closing that space hit the valves with a hammer-like tap! The usual mechanic's method is to eventually get a valve and lifter replacement repair for about $2000+ in cost. The motor is half removes and each part cleaned and inspected. The parts that hold valves are send to a machine shop for resetting. New valve lifters replace old ones, and a new oil pump is installed - as the usual remedy. The other way.... we like better! Slo-wear's engine tap remedy: Directions. The following shows you how to end all 3 causes of engine noise including its engine tap remedy, yourself! As you noticed, valve tap is caused by several conditions, and now Slo-wear has a new, and better way to end your engine clicking by ending the 3 causes of noise. Engine Tap Remedy Directions are Simple. Step One: Just add the 3 products marked 1,2, and 3, to the gas and oil as described. It easy! Drive for a week to let the 4 cleaners clean and free the noise, residue coated parts. Step Two: A week later at oil change, install the other 3 items. Drive as usual, the noise will have ended during this treatment as anti-wear and friction modifiers and conditioners heal, ending the noises - and returning your motor - transmission if serviced the same way, to their original quiet, smooth operation. Order Two Mega Power Valve Treatments to protect both your car motors. 12 items needed. Just $135+ $15s&h= Total $150. Six Treatments for 6 Motors. For fleet, or auto repair resale. 36 items. $300+ $15s&h+ $315 total. Save $180. Protect both your motor and transmission too! Order a Treatment of the 6 items shown, for your motor $95, and a similar Treatment - The Mega Power Transmission Service #TS3, 3 items, just $75, for the transmission you want to protect: Both,9 items just $125, plus $15s&p= $140 total. [Regular price for both $170] Save $30. To ask a question or to order, call me day or eve at 1 512 665 3388. ...george. I'm a mechanic. Why cleaning your motor interior - and with 4 different cleaners plus conditioners and friction modifiers is the best way to actually extend your motors life - while ending its tap, noise condition and ping. About engine flushes with solvents = Warning! It's especially important to use a flush product containing detergents, dispersent's, anti-coagulants, and a friction modifier. Those we found in the product we recommend to end this problem - Mega Power I dubbed The Slo-wear Valve Quieting Treatment. Flushes with solvents can and do damage engines. Stay away from them. They usually warn you of the danger, by saying; "Do not speed up the motor with this product in your oil. ""Do n ot drive with this product in your motor." Read the label. Make sure the flush you use to help end or stop the tap has no solvent, but has the four ingredients: detergents and friction modifiers. Good! Remember: If you Flush your motor. It's especially important to use a product containing detergents, dispersent's, anti-flocculents, and friction modifiers - like found in Mega Power. The Mega Power Engine Treatment! This Treatment quiets the tap and motor noise almost instantly. Cleans, Frees, Protects. Ends blow-by, improves compression. Restores power. Now it's time for your motor to be so treated! Save $30. Protect both your motor and transmission too! Order a Treatment of the 6 items shown, for your motor $95, and a similar Treatment - The Mega Power Transmission Service #TS3 3 item Treatment, $75, for the transmission you want to protect: Both, $125, plus $15s&p= $140 total. [Regular price for both $170] Save $30. Now don't get alarmed over all this. I have an easy fix for you to end your problem and a simple way to prevent it in all your motors - for a money-saving, problem-avoiding upgrade. In all this, the Slo-wear Mega Power Treatment uses 3 ingredients to clean the top of your motor where air and fuel and exhaust go - to rid the noise problem from that areas. 3 others are use during an oil change a week later. This method, using chemicals to free, clean and protect, ending your noise, is a great improvement over all other products that just rinse your motor - and often.